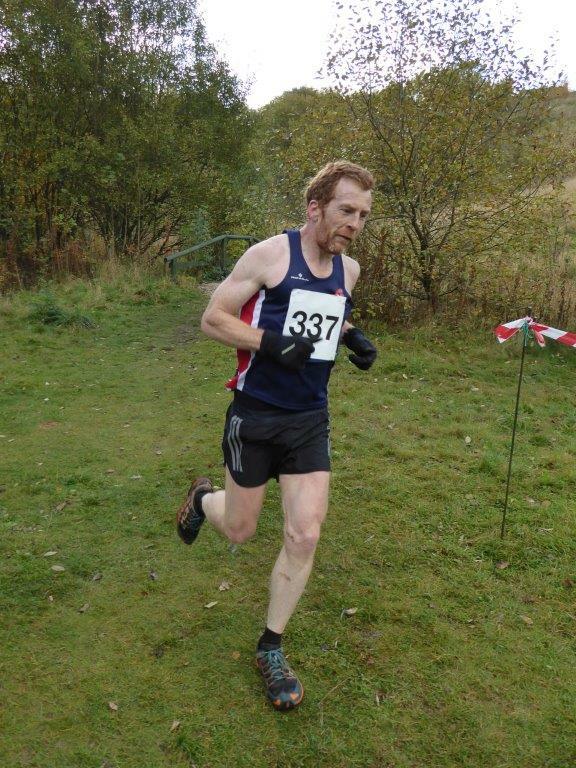 A classic BM fell race with a challenging mix of fells, trails and lanes. Sunday 20th October 2019 10.30am. Stoney Wood up from the Lime Kiln pub on Cromford Road in Wirksworth. Enter in advance to guarantee your place or on the day. Entry fee is £5 in advance or £7 on the day. The race is open to anyone aged over 18 on the day of the race. In 2011, Wirksworth RC members were cogitating on their new found enthusiasm for fell running. 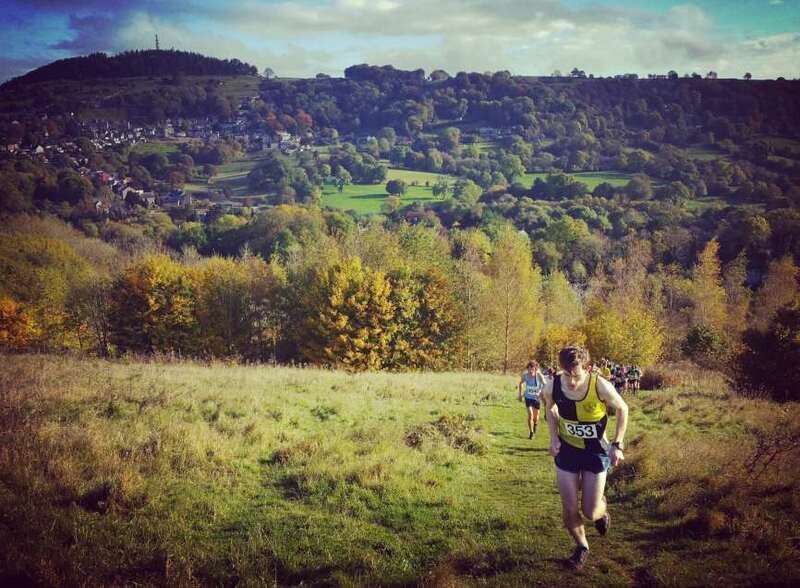 Wouldn’t it be good to have an Autumn race to complement the already established and successful Incline race, held in the spring, they thought. After an internal club competition to come up with a route, the Undulator was first run in the autumn of 2011. The route has remained unchanged since then. 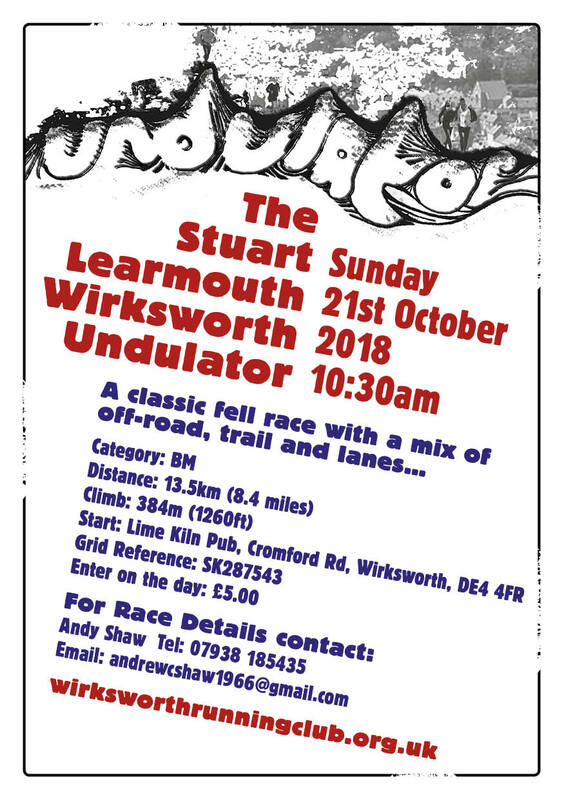 After the sad loss of a club member to cancer in 2012, the race was renamed the Stuart Learmouth Memorial Undulator for the 2013 race and remains so to this day. The route is challenging, there are steep bits, flat bits, rocky bits and fast bits, road bits, grass bits, trail bits and scary bits. Everywhere you will see mother nature, attempting to recover from the industrial predations of the last few centuries, hampered and tampered with by man. The route starts in Stoney Wood, land reclaimed from Stonecroft Quarry planted with trees and now an important green space near the heart of Wirksworth. The start is narrow and very steep as it climbs to the stardisc at the top of the quarry. After a brief respite the route crosses the old Middle Peak Quarry and circles the quarry boundary, climbing all the time until coming out onto pastureland. 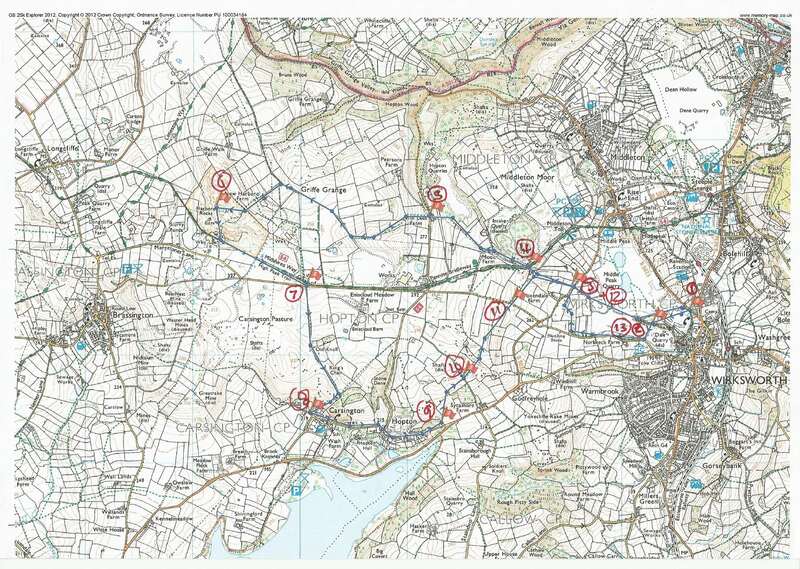 The route crosses a number of fields, heading towards Middleton Top and the historic winding house at the top of the Middleton Incline of the Cromford and High Peak Railway. After crossing the B5035, the route continues in an upward fashion, crosses the High Peak Trail and opens out onto open farmland. This is the first time that you’re not climbing since the start and we’ve broken through 1000ft, that’s a climb of about 440ft in a shade under 2 miles (or 135m in the first 3km for the metricated). In front of you now are the wind turbines around Ryder Point Quarry. There’s a quick drop down to a road crossing and then a very steep climb up to the track joining the Ryder Point Quarry and Brassington Moor Quarry. This time you’ve reached 1180ft above sea level. There’s another drop and now another very steep climb up to the trig point on Harborough Rocks, an outcrop of dolomitic limestone popular with climbers, and you’re at the top. Nearly halfway and you’re standing about 1230 ft above sea level with fantastic scenery in all directions. The next challenge is getting down. If you know where you’re going, there is an almost direct route, through the crags and boulders, down to the High Peak Trail. If you don’t, then follow the flags gently! Once off the rocks, the next 2 miles are generally down, the first is along the High Peak Trail, the former track bed of the Cromford and High Peak Railway, so it is pancake flat. 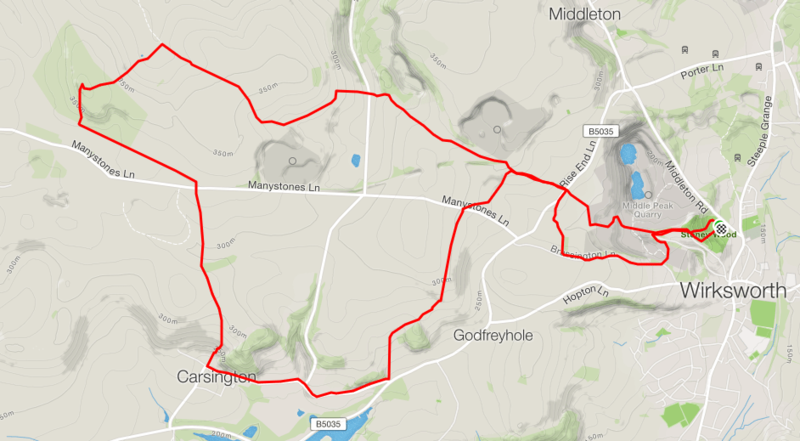 The second takes you off the trail and onto Carsington Pastures, alongside the Carsington windfarm and then very steeply down into the village of Carsington itself. All the way, you will have views of Carsington Water, a man made reservoir opened in 1992 and now a popular sailing venue. All that climbing has gone and we are back down, pretty much where we started, travelling along the Carsington to Hopton village road, passing Hopton Hall before leaving the road and heading back up towards Middleton Top on the last major climb. Over 6 miles gone at the bottom, 7 gone by the time you turn at Middleton and head for home. The last mile and a bit are all downhill straight through Middle Peak Quarry and then skirting the edge of Stoney Wood before dropping down again to the finish line. Sign up for the Undulator!